Enjoy a royal welcome to Istanbul as you’re picked up by a private guide, escorted around the sights in a luxurious Mercedes-Benz minibus and whisked to the front of the queue at the city’s most popular attractions. 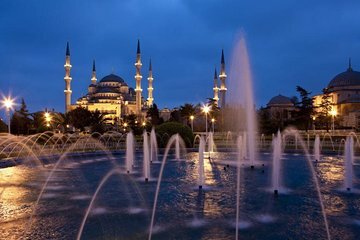 A great introduction to Istanbul for first-time visitors, this full-day tour includes visits to the historic Hippodrome, the exquisite Blue Mosque and iconic Hagia Sophia. You’ll also experience the lavish lifestyles of the Ottoman Sultans with a tour of Topkapi Palace and spend time browsing the colorful stalls of the Grand Bazaar. around Istanbul. It was an interesting tour, it gives us additional knowledge whats the Istanbul history all about. I decided on spur of the moment to take a tour of Istanbul as it had been many years since I last did it. My guide was a young man called Eren who turned out to be extremely knowledgeable and friendly and knew everything about all the favorite and well known sites. It turned out to be a very enjoyable day and I would certainly recommend this company and guide. Tour was great and guide Ceren very professional, with great knowledge of ancient history and especially Turkish history, being able to answer all questions about city, monuments and Turk history. Tour muito especial. Nosso guia Hussein se encarregou de nos o mostrar o melhor dos principais pontos turísticos de Istambul e ainda nos apresentou um restaurante típico de cozinha tradicional turca. Awful. The worst guide I have ever had in all my years of traveling. He was disheveled and not very clean. He was completely disengaged. He never gave us a single piece of information that couldn't be found on the placard next to the monument or artifact. We started at the Topkapi Palace where he correctly took us to the Jewel room first in ordered to avoid the lines. There is a rope line that one must follow. He allowed us 45 min for a 10-min tour. When we exited, he was nowhere to be found. Not at the meeting place that was arranged nor anywhere near it. when he came back 20 min later he was clearly coming from someplace out of the area. He kept asking us if we wanted him to go in with us--for example--at Hagia Sofia or did we want to go alone. Wherever we walked, he was always 10 paces ahead of us so there was no chance for us to browse in the shops for fear of losing him as we had no way of contacting him. I used Viator for the first time in Athens, and our guide was fantastic. I never had such high expectations, but I did expect some level of cleanliness, professionalism, knowledge and engagement. He had none of these qualities. Even though we had booked the car and guide for a full day, we told him to have the driver take us back to our hotel after lunch as we literally could not stand to spend one more minute with him. I have given him 1 star because I'm obliged to do that for your rating system to work, but he doesn't even deserve that. We thoroughly enjoyed our experience in Istanbul. One word sums it up........excellent. Eren had a real skill in avoiding queues etc. He had excellent knowledge and was very polite and helpful. He also assisted hugely with advice over purchases, I am in his debt for that. This tour was well worth the price, don't miss it!